Churches, temples, mosques, and synagogues are hubs of activity in the communities they serve. Far beyond the weekend worship service, they are home to civic meeting spaces, classrooms, auditoriums, and other community uses. However, as congregations and communities change, so must worship spaces. Many traditional churches are contending with aging congregations, while other denominations are increasing or following development patterns into growing communities. While some churches may be dealing with falling attendance, others are expanding their role in the community. Ensuring congregants are welcome and comfortable is a crucial part of bringing people in the door, and keeping them coming back. Great acoustics are as important a comfort factor as lighting or seating. A space with poor acoustics can leave congregants straining to hear, missing important discussions, or annoyed by loud or distorted music. On the other hand, good acoustics can help foster a connection between the presenter and the congregants, keep the focus on the message, and make music sound its best. 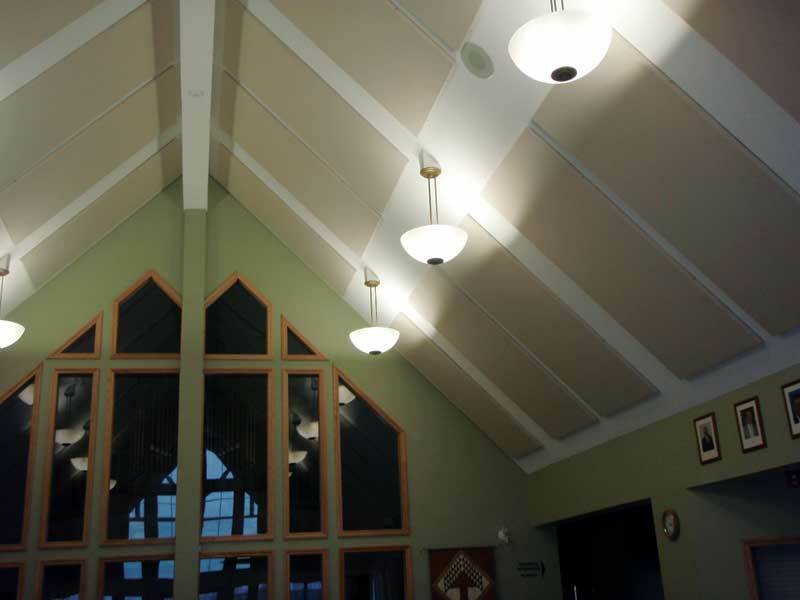 When it comes to acoustics, some challenges have always existed, even in old, traditional worship spaces. Churches and other worship venues tend to be large, open spaces with very high ceilings––creating the conditions for reverberation, echo, and sound deterioration that blares at those in the front, while creating a challenge to hear in the back. 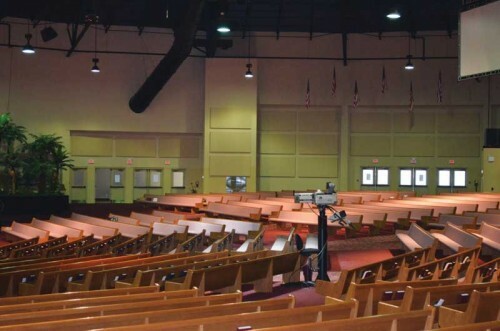 In the main sanctuary or worship space, the primary acoustic challenge may be the tension between the need for speech intelligibility, balanced with the need for a space where music and song, and, in particular congregational singing, sounds big and resonant. The effects of reflective surfaces in this church hall are countered with wall- and ceiling-hung absorptive elements. Spoken word clarity is affected by three issues: early reflection, echo, and reverberation. Many worship spaces may have a sound delay time of between three and six seconds, whereas 1.5 seconds would be a better target. Worship spaces also require a natural ambience for congregational singing, where some of the liveliness resulting from primary reflection may be desirable, rather than the dead quiet of a space with extensive absorptive treatment. Building new room shapes that avoid parallel walls make for better acoustics. Pie-shaped, semi-circular, or trapezoidal spaces all work well. Square, rectangular, or round spaces almost certainly require extensive treatment before occupancy. Similarly, length-to-width ratios have an important impact on acoustics. For best results, architects and designers should avoid 2:1 ratios in room length and width. Balancing the use of diffusive and absorptive treatments helps keep speech clear and music sounding its best. 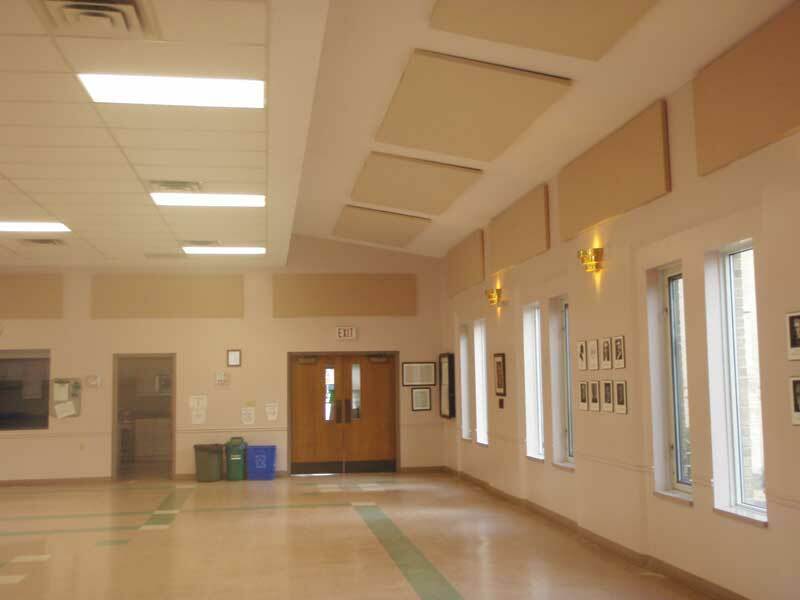 Acoustic treatment should cover 20 to 30 per cent of wall surfaces, depending on the space’s size and shape, as well as other considerations such as the materials used on the ceilings and floors. On walls, diffusion can be achieved through incorporating built-in wall louvres or other millwork for a durable, polished visual effect. Surface-mounted diffusive panels are an easy and cost-effective alternative. These may be wood veneer panelling or fabric-wrapped panels with a diffusive core. Likewise, diffusive elements can be built into the ceiling design, or panels can be hung as sound clouds using cables or mounting systems. To strike the right amount of resonance in the seating area while maintaining speech clarity, one should balance the diffusive elements with absorptive panelling. Fabric-wrapped panels are a good choice for absorption. Since the interior insulation is far denser than other alternatives like foam, less square footage is required to achieve the same acoustic effect. One should look for fabric-wrapped panels that have a wood frame––these are more durable than resin-hardened panels, and introduce an air gap between the insulation and covering fabric that enhances the acoustical performance and prevents the insulation from showing through the fabric. Absorptive treatment on a vaulted ceiling. The floor is another area where designers should seek to strike a balance between the absorptive surfaces that promote speech intelligibility and the reflective surfaces that make for a great choral singing space. Many designers choose to combine a hard surface like tile under the pews, with carpeted areas on the stage/altar area and down the aisles for quiet entry and exit. As congregations age, the need for sound clarity and consistency becomes more important. Echo is a particular issue for individuals with assistive hearing devices or who may have diminished hearing capacity. In a space with very poor acoustics, up to one-third of the speaker’s words can be distorted or otherwise inaudible. Often, in these situations the sound system is turned up, resulting in noise that is too loud, but no more clear. In many churches, one will find sound systems too small for the space, resulting in sound too loud up front, and not loud enough in the back. Churches can pour a lot of money into their sound systems in an effort to compensate for problems with the space’s acoustics; but even the best system cannot overcome fundamental acoustical issues. Another consideration involves the hollow spaces below stage areas that are common in some churches. They can provide great storage in some cases, but they can resonate low-frequency noise like a big bass drum. One should ensure the stage cavity is insulated, and place absorptive and diffusive panelling around the stage area. Worship space designs have evolved in tandem with changes in worship styles and philosophies. There continues to be a move toward more open concept or ‘in the round’ spaces, offering an intimate approach to the worship service. 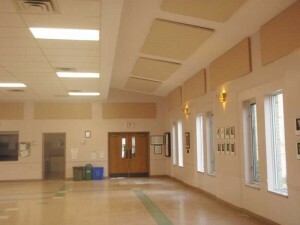 Acoustically, however, these spaces tend to focus sound energy into the space’s centre, hampering speech intelligibility. In these cases, the room’s periphery must be treated with absorptive panelling. Other houses of worship are adapting former commercial or office spaces and need to retrofit for the new purpose. Low ceilings and hard surfaces are among the issues in these instances. To make the best of a retrofit space, one must minimize the hard surfaces with carpet, suspended ceiling tiles, and wall-mounted panelling. For the most economical investment in acoustical treatment, this author advises treating the space’s sides and rear as a priority over the front of the room.